Adele had you at “Hello,” but her meteoric comeback after three years of silence involved far more than lyrical stories and an amazing voice. This remarkable Grammy-winner is also one of the savviest marketers in the music business, and we can learn some valuable lessons from her branding strategy. Her promotional tactics were precisely calculated. She announced her album release on Facebook and capitalized on the holiday shopping season to sell 11.37 million copies in the first month. She also refused to make the album available via streaming, opting instead to perform live performances that could be streamed on demand. Adele doesn’t try to be anyone but herself. She lives a relatively normal life, despite being a pop superstar, so that her music is relatable. She speaks openly about her struggles with body image, failed relationships, and other personal trials. Adele seemingly has nothing to hide, which is why so many people love, trust, and follow her. One recurring theme throughout her albums is personal growth. She shows great respect for music of the past, but she also accepts the changing industry and adapts accordingly. You don’t easily come back after a three-year hiatus without the ability to take the pulse of the public and create music they want. While Adele is an independent powerhouse, she isn’t a one-woman show. Her branding strategy utilizes numerous promotional platforms, backed by a vigilant team that helps her plan every move. She also partners with other performers so they can cross-promote each other’s careers. 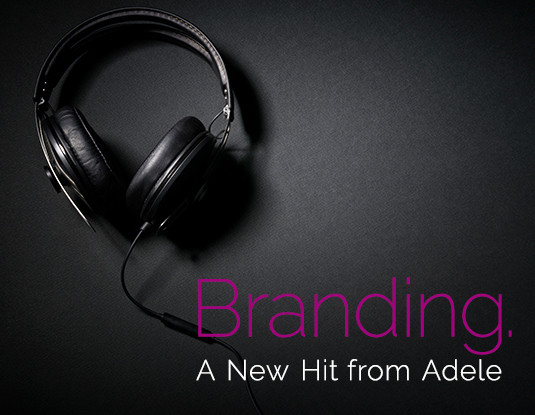 Based on A Lesson in Branding Strategy From Adele from THREE21.com.